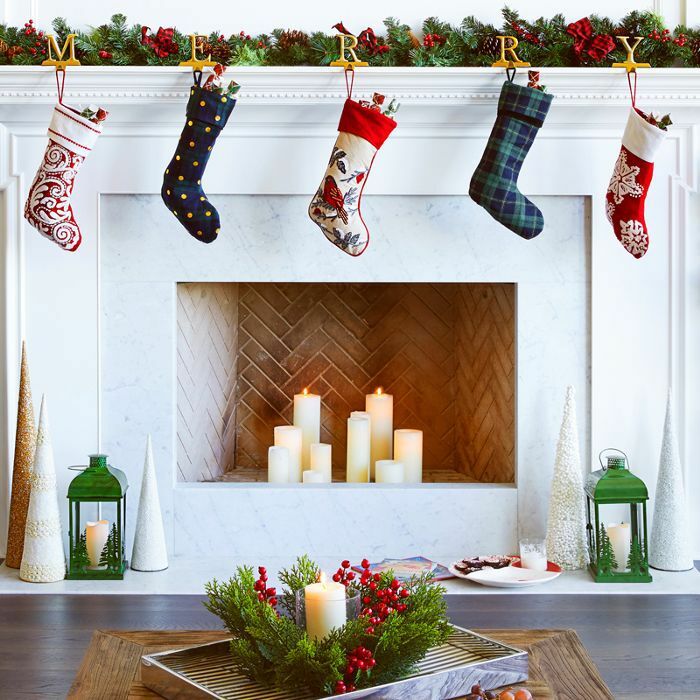 This year, when actress and television personality Vanessa Lachey wanted to deck the halls of her stunning Los Angeles home, she turned to a shockingly affordable retailer in search of festive holiday décor—HomeGoods, the beloved brick-and-mortar chain of discount home furnishings. "I love exploring every aisle, especially during the holidays," the star of Hallmark's A Twist of Christmas told MyDomaine. "The store is a treasure trove of inspiration for creating your holiday vision." Keep scrolling to step inside Vanessa and Nick Lachey's Los Angeles home—completely decorated for Christmas—to fuel your holiday decorating inspiration. It's so chic that we honestly can't believe everything was sourced from HomeGoods. Below, the host of Top Chef Junior shares her holiday decorating tips, including a clever place card idea that doubles as a parting gift for guests (we're stealing this tip for ourselves). The actress's number one piece of advice is to stay true to your personal style. "There are so many stylish decorating choices for the holidays, I recommend going with what speaks to you and gives you that aha feeling," she says. "My style is a mix of traditional and contemporary, so when I found festive red-and-black buffalo plaid pillows at HomeGoods, I immediately decided to make the pattern a focus point in my favorite entertaining spaces." "After I grabbed pillows for the living room, I found an adorable lumberjack nutcracker, a festive garland to hang from the mantle, and ornaments to layer on the tree—all with buffalo plaid to tie together the space effortlessly," she explains. "I love how the red makes the space pop!" With this color palette in mind, the actress curated a collection of mixed-and-matched stockings to hang from the mantle. A faux-evergreen garland dotted with red berries ties the look together and brings the outside in, while lit candles in the fireplace lend a welcoming warmth to the space. Although Lachey walked into her local HomeGoods with the intention of shopping exclusively for holiday décor, there was one big ticket item that caught her eye. "We've been renovating our home and on the hunt for a new couch for our living room," she divulged. "Since I do so much holiday entertaining, it's important to look for furniture that's kid-proof (aka spill-resistant) and made with high-quality, durable fabric," she explained. "I spotted a gorgeous tufted blue sofa that really served as an anchor piece in decorating my formal living room. It goes beautifully with the buffalo plaid and the rest of my classic red-and-green holiday color scheme." To make the tablescape flow with the rest of the décor, Lachey opted for buffalo plaid placements, red-trimmed napkins, and a faux-evergreen garland complete with red berries for the centerpiece. Then she cleverly attached a snowflake ornament to each napkin ring and wrote her guests' names on them for a unique spin on traditional place cards. "Getting creative with an inviting tablescape is one of my favorite parts of hosting," confesses Lachey. "I love that I can go to HomeGoods and find stunning serving ware at prices so good that I can mix and match to create a formal or casual look depending on the event," she tells MyDomaine. Inspired to go all out this season? Up next, shop Emily Henderson's under-$100 Target holiday décor edit.